The nature of a progressive school is to keep pushing forward, to never be at rest. Jackson Academy’s original mission in 1959 was considered innovative: to teach reading by phonics. Counter to academic trends at the time, our founders believed—and evidence showed—that phonics, in-depth reading, time for play, and exploration of the arts all contributed to stronger student success. An independent college preparatory day school in the heart of Jackson, Mississippi, JA continues to embrace innovation today. In 2013, JA joined a small group of schools and colleges worldwide recognized as an Apple Distinguished School for innovative use of technology in teaching and learning. JA is Mississippi’s first K3-12 school to receive the designation. The Apple Distinguished School mark is reserved for programs that meet criteria for innovation, leadership, educational excellence, and demonstrate a clear vision of exemplary learning environments. JA has assisted schools in Mississippi and other states in developing similar programs. In 2015, Apple renewed JA’s designation as an Apple Distinguished School through 2017. Preparing students for their best future remains at the core of the school’s purpose. Positive: A child’s first, most important lesson: You can. Collaborative: What we do together is always greater. Progressive: If we’re not ahead of the curve, our children will be behind. Student-Centered: After all, children are our raison d’être. 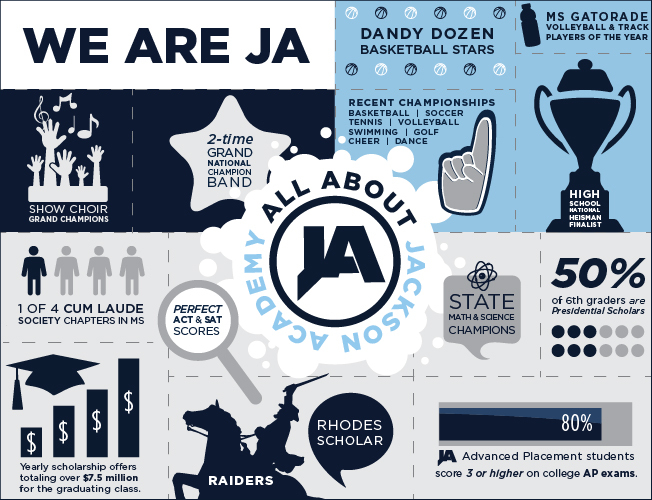 Jackson Academy admits students of any race, color, national and ethnic origin to all the rights, privileges, programs, and activities generally accorded or made available to students at the school. It does not discriminate on the basis of race, color, national and ethnic origin in administration of its educational, employment or admissions policies, its scholarships, athletic or other school-administered programs.